FAQ – Les Bébés Amphibies Int. The best age is AS SOON AS POSSIBLE not only do we teach them vital self-life saving skills, but it also enhances the way babies and toddlers learn other skills, too. We take them from birth, ask us for more details. Swimming is the only sport that can save lives and is extremely good for your health, see our “What are the benefits” page. Does an adult need to be in the water? 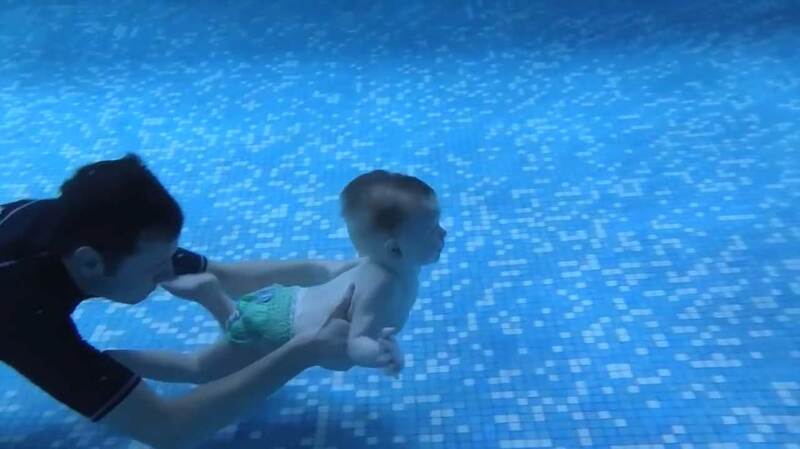 Yes we do not use buoyancy aids and your child will not be able to touch the bottom, this is the best way to learn to swim so they are confident out of their depth. No the water is shallow enough for adults to stand up in, a lot of our parents can’t swim this is why they want their children to be able to swim. Should baby have had their immunisations first? No the NHS state that babies can go swimming before they are vaccinated. See NHS guidelines. Everyone has different metabolism and digestion levels, but it is important to not feed your child any less than 2 hours before the lesson, and make sure their last meal is something easily digested. No fruit on swimming day unless it is in puree form. Babies and toddlers will be hungry after their lesson so it is good to bring them a bottle of milk or a snack for afterwards. Lessons start promptly each class lasts up to 20 minutes plus up to 10 minutes maximum in the Jacuzzi (depending on the age of your child) This is not part of the lesson but is kindly offered by the Hotel. Please do NOT arrive down in the changing rooms more than ten minutes before your lesson, space is limited if you are early please wait in the lounge area of the hotel. Can we come early to watch the lesson before? No as space around the pool is limited and becomes a health and safety hazard if it is crowded and we also have to be mindful of and respect the hotel residents. No because as above space is limited around the pool and becomes a health and safety hazard if it is crowded. STRICTLY ONE adult per child participating in the lessons is allowed, anyone that is accompanying you must wait in the lounge area and must not come down to the basement at all. There are male and female changing rooms and a family changing room. Changing mats are supplied, changing your baby on a mat on the floor is the safest place to change your baby. If using a changing table supplied there are no safety belts to hold your child so please do not leave your child unattended. Can the children wear goggles? No at Bébés Amphibies we do not allow goggles as a child that cannot swim with his eyes in the water without goggles is not safe! As even if he/she can swim if ever they fell in the water without them they would close their eyes and panic. Safety comes first in our club. You can join Bébés Amphibies any day of the year, we only stop for 5 weeks a year, plus some bank holidays as we believe continuity is important for the children and their progress, and stopping for all school holidays, bank holidays etc. means stopping 14 to 16 weeks a year. We offer replacement vouchers for 4 weeks holiday for parents absences per year outside of our 6 weeks holiday (2 at Christmas 2 summer and odd days for training etc.) These must be booked 8 days in advance and used within your active term. These can not be refunded or added to the end of the subscription. However they can be renewed once as long as we are notified just before they expire. Warm clothes for after and a hood in the winter to protect their ears when going out in the wind. What if baby is unwell? Babies frequently get colds, as long as they don’t have a high temperature then its fine to bring them swimming, But if they have a chesty cough, temperature, upset tummy, ear infection or any other contagious infection they must stay away. No, photos are strictly forbidden. If you wish to have a photo please ask us to take one, we will then put it on facebook and you can download it from there. Any photos or videos that we take will be put on facebook we do not send them individually by email etc. What if my baby or toddler cries? It is totally normal to start with as there will be a new environment, new teacher, with people they don’t know and we are putting them out of their comfort zone, once they get used to it and become more confident they will be fine, Then again when we do something new they may cry again as we will be putting them out of their comfort zone again. What if I want to cancel my lessons? You must cancel your subscription on your homepage at least 25 days before your last lesson if you wish to stop, as after this timescale you will automatically be signed up for your next term. Please see terms and conditions for full details.